Cat scratching - Stop Your Cat Destroying Furniture. 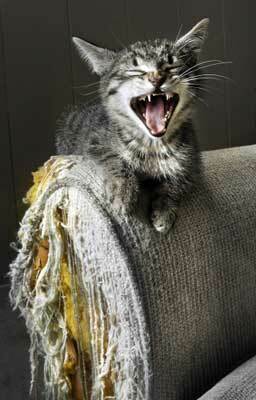 Save Your Sofa From This Cat Behavior! Cat scratching the furniture only seems to be a problem for some cat owners. Some cats never display the slightest interest in the soft furniture around the house. Whilst others seem to want to shred everything in sight. 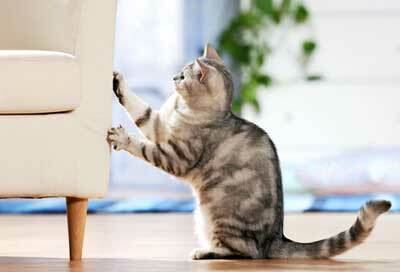 Unfortunately for those owners whose cat is a furniture scratcher it can be a very costly and a distressing problem. We have been really lucky and we have never had a cat that has felt the need to shred our soft furnishings. This page Is aimed at those owners who are probably at their wits end and who are surrounded with shredded furniture and who are looking for solutions. It will help you understand why felines like to display this behavior and how you can prevent your cat from continuing to do it. 1. Why do cats scratch furniture. 2. How to stop this destructive behavior. What Is Cat Scratching And Why Do They Do It? In the wild cats use their claws for hunting, climbing, balancing and in self defence. Claws play a vital part in the animals every day survival and so they need to keep them in tip top condition. In the wild and outside they scratch on rough surfaces like trees and fence posts to clean the nail beds and to shed the dead outer claw layer, leaving a sharp new point underneath. Cat scratching is also involved in marking territory. The claw marks and the scent of the cat is left on various surfaces around its territory letting other cats know who’s boss. So you can see why they still love to scratch things, even when they are indoor cats – it’s a natural and healthy thing for them to do! You can help them to scratch safely by buying them a scratching post and also protect your furniture at the same time by using products such as Sticky Paws Scratch Control Strips for Furniture. In this way, your pet won’t feel frustrated and you can feel at ease! There could be many reasons why your pet may decide to use their claws inside the home. Exercise & cleaning: Cats that are confined to the house will still feel the need to carry out the natural cat behavour of keeping their claws in tiptop shape. They may not need to mark their territory but they will still need to exercise those claws. Habit: The texture of carpet and the various appealing shapes of armrests can become firm favourites for your cat. If they discovered these items early on in their lives then it could just be habit that they continue to use them as their preferred scratching area. Frustration and Boredom: A pet that does not receive enough attention from their human friends will look for other things to amuse them. A loose piece of wallpaper can sometimes be just too tempting and becomes a great cat scratching play game. Insecurity: If changes happen in the home environment like a new baby or a new animal is introduced to the family, your cat may feel vulnerable and insecure. They will then try to establish a place for themselves within the new family situation. Some revert to urine spraying to reinforce their territory while other will scratch areas especially around doors to make themselves feel secure once again. What Can Be Done To Stop Cat Scratching? First all don’t blame your cat. They are only doing what comes naturally and they don’t seem to appreciate the concept of interior design and property! Its better to try and redirect her behavior, so that she can continue doing what she likes best but without destroying your lovely home. Providing cat scratchers Is one of your first priorities when you get your cat. These come in many form from posts to a cat tree. 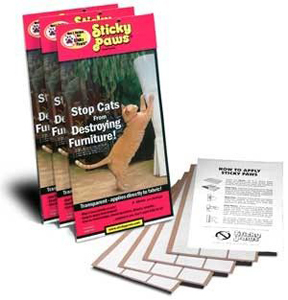 Sticky Paws Scratch Control Strips are a brilliant and humane way to deter your pet from destroying your furniture and fittings! They are transparent and easy to use and you can stick them almost anywhere you don’t want your pet to scratch. Far cheaper than buying new furniture, so why not give them a try? Scratching Post: By providing a cat scratching post and other cat scratchers in your home, you may turn your cat’s attention away from the furniture. Choose one that is attractive to look at and has lots of different textures and play things on it. A cat tree may be the best option as it has many different uses as well as for scratching (see my page for the variety of cat trees available). If your cats normally like to scratch the carpet or a mat then it may be an idea to cover the post with a similar item. Place the scratching post in the same area where your pet was scratching in the home. 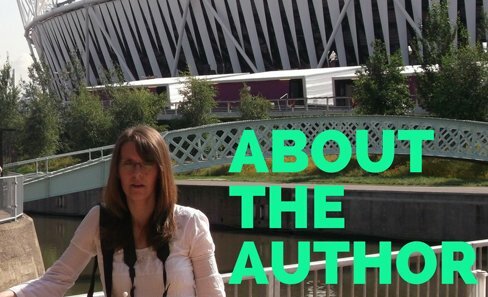 Then once they are used to the post, you can gradually move it to a more suitable area for you. Play: If cat scratching is more to do with the fact that they are bored, try playing with them more, perhaps a few little games throughout the day to help keep them a happy cat. If you are out and they are left in doors, make sure they have plenty of toys scattered around to play with on their own. Security: A cat which feels insecure will want to spread their scent around the house by scratching everything in sight. If you think this might be the reason for your cat’s behavior then you could help them feel more secure by making your home smell more like your cat. Rub a clean soft cloth around your cats face and then rub the cloth on various areas around the house to transfer their scent. You wont smell anything, but it might make a big difference to them! Trimming Claws: Some cats don’t wear down their claws as quickly as others and they become over long and can no longer retract completely. This can lead to them becoming snagged on carpets and furniture. Your vet will be able to trim the claws for you and this may need to become part of your regular pet care, but if you feel that you can do it there are a couple of rules to observe. Use a good pair of cat nail clippers. Get your pet used to having their nails clipped - rub their paws often and then give them a treat. Gently squeeze your cat’s paw so that the claws are exposed. Only clip the very top of the nail, you will see the pink quick, which is a blood vessel. Never cut into this, as it will bleed and hurt your cat. I won’t say too much here as I have very strong views on this issue. But why declaw when there are easy and humane solutions available such as the Sticky Paws Scratch Control Strips ? Having a vet completely remove your cat’s claws involves removing bone as well. It's not like having your nails cut, it's actually similar to having your finger amputated at the first knuckle! It is cruel and completely unnecessary. Please don’t do it. If you feel that you cannot live with a cat that has claws then please consider having them re-homed.